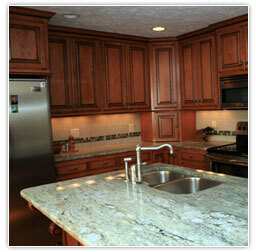 We recently had Custon Cabinets make our cabinets for us and are extremely satisfied. The workmanship and quality are outstanding. 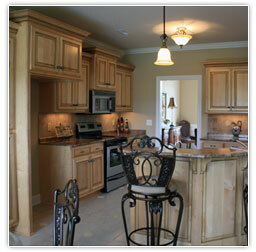 We chose maple for our cabinets, which seems to be very popular in the Huntsville area according to Mr. Kirkland. We chose honey maple and also had them glazed and we would recommend the glazing to others. Another important feature for the ladies are roll out shelves for the bottom cabinets. This is truly a life saver for ones back and makes access easy. It is an expense worth considering when planning your cabinets. Our daughter also had new cabinets built by Custom Cabinets and is delighted with the appearence and workmanship. The cabinets were delivered based on the schedule we agreed to and we were happy with the installation. 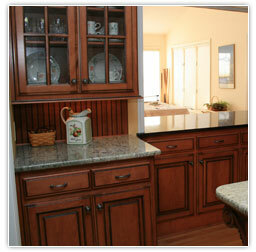 We highly recommend to anyone shopping for new cabinets to check with Custom Cabinets. It is refreshing to work with a vendor who is prompt, dependable and delivers a fantastic product. My cabinets are beautiful, functional and the specially designed island is the focal point of the kitchen. Kevin installed beautiful cabinets in my rental house in 2009. I was completely satisfied with his design work, installation and professionalism. I would (and have) recommended Custom Cabinets to my friends. When I was building my house 10 years ago, my contractor suggested using Custom Cabinets to build and install my cabinets. Kevin took our house plans and listened to our wants and used this information to create a beautiful set of kitchen and bathroom cabinets in oak. After 10 years, these cabinets still retain their beauty and no door or drawer has failed. I was so impressed by the quality of the cabinets that when my wife and I decided to add cabinets to our utility room, I went looking for Kevin at Custom Cabinets. Kevin again took the time to explain all our options so that there would not be any surprises, he created a drawing to show what the cabinets would look like, showed us the color and style options, and he then built and installed the final cabinets in a short amount of time. Since Custom Cabinets are truly custom, Kevin can build the cabinets to match our needs and he does not have to modify our needs to fit the cabinets that he has in stock. The new cabinets in the utility room are as beautiful, sturdy and functional as the ones that Custom Cabinets installed in my house 10 years ago. We remodeled a 1983 house in 2009. We made a lot of special changes that we wanted to the house. We wanted new cabinets and the kitchen turned out to be outstanding thanks to Kevin, the owner of Custom Cabinets and Counter Tops. Kevin is by far the best cabinet man we have ever used and we have used several over the years. He truly goes the extra mile; he is honest and dependable.